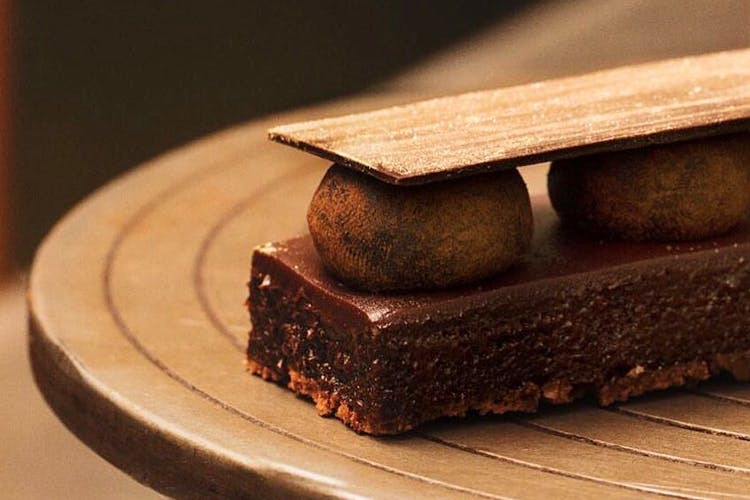 Sandy’s Chocolate Laboratory, one of Chennai’s most popular places for everything chocolate, will make you want to start the day with dessert and we’d say go for it! Eight years ago, admittedly, I was addicted to the oh-so sinful Dark Chocolate Milkshake that came quite literally in a beaker and would end up craving for it every other week. From then on, Sandy’s has had a very special place in my heart. Returning after more than half a decade I found that the place in Nungambakkam looked pretty much the same – the ambiance is still simple & classic (with black chairs, white tables and a couple of high -seated chairs along the centre of the cafe)- no fluff here. But the menu had definitely amped up and I was ready to just dive right in. You obviously have to try the dessert here. No buts, people! That Really Tiny Chocolate Cake 3.0 has been an obvious favourite because the cake really is anything but tiny. For INR 220 dig into this multi-layered chocolate cake, with rich ganache and Belgian chocolate, and prepare yourself for a quick trip to chocolate heaven. There’s also the Nutella Choco Bar (version 3.0) that is a hot favourite for INR 180. Although I was tempted by Can’t Make Up My Mind (I really couldn’t!) which had a brownie, cookie, and cheesecake, I decided to go with The Indie Road. This came with half-baked chocolate chip cake topped with Gems, Kit Kat, fudge and my personal favourite – viscous, gooey marshmallow! This was so so good – don’t be fooled by its portion size – it’s pretty filling. If you’re in a hurry you can even grab their dessert jars to go – choose from Nutella Tiramisu, Lemon Meringue, and Red Velvet to name a few. They have soups, salads, small plates, mains, burgers, and sandwiches. And a whole ton of drinks like cookie shakes and milkshakes. For mains, I ordered the Slow Braised Belgium Pork Belly with a sweet beer caramel sauce and roasted veggies. This was a bit steep at INR 900 but the pork was cooked to perfection, tender bits easily fell apart with the touch of the fork. and that sauce was just yum. They also have breakfast available all day. From Eggs Benedict with ham, hash browns, waffles, and french toast, take your pick. But we’d recommend starting the day with dessert because we think you’re going to love it a choco-lot!